This week we have been asked to discuss some of the leadership principles that are illustrated effectively in Sun West’s and Regina Catholic’s approaches to Edtech innovation. There has always been some wavering among the different staff members that I have encountered throughout my career with innovative technology practices within the realm of education. Either technology has intimidated them so much that they are too hesitant to let students have some control over their learning experience or they become too frustrated with connectivity issues. Technology needs to be efficient – Management of the classroom. Having technology in teachers hands 24/7 makes them more apt to have that technology ready and available. Real life problems – authentic ways of using technology. These are all good things that happen when utilizing new and different technologies within the classroom. I think that the most important aspect of these four guidelines is the first: focus on good teaching. It is imperative that this is the main focus when implementing technology within the classroom. Students need to know what they are doing, why they are doing it, and most importantly need to know how to properly use the technology. Without a purpose, there is going to be confusion and disengagement and that is where student development starts to plateau. I found these to be a great baseline for teachers and students for what the division wants to achieve through the use of technology in the classroom. If we are using these tools with our students it is important that they are expanding their horizons as learners through the technology. These technological implementations with help them learn and connect with others from a resource that helps them go beyond their school classroom and building. How do teachers implement proper use of these new technologies in their classroom? The answer is to follow the SAMR Model. There are four different categories for technology integration into learning environments. 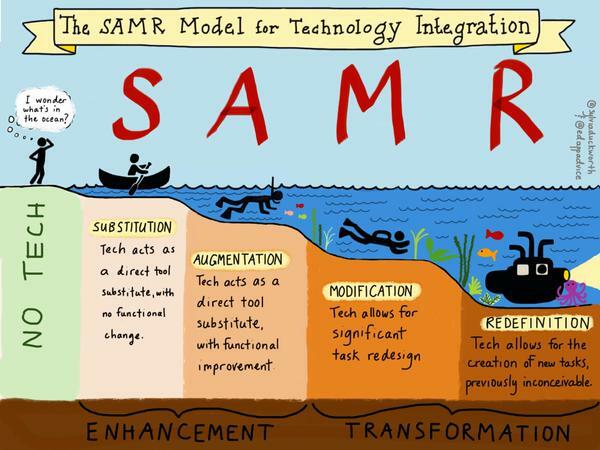 Below is an image the illustrates the SAMR model in a very easy to understand way. This model might help those teachers hesitant to use technology in the classroom. It ranges from substitution through redefinition, and the key aspect is that you can go back and forth, not always needing to be in the redefinition stage. The key to all of this, however, is the fact that there needs to be a reason you are utilizing the technology. There needs to be a purpose and once teachers begin feeling comfortable with the technology tools they are using the greater impact they will have on their class. Must have support for the teachers and students. The biggest piece that helps with the success of this program is the third point, in my opinion. There needs to be greater tech support for teachers and students when implementing technologies. With this program, they have a trained professional that is not necessarily a teacher supervising online instruction. This type of support is crucial to the success of technology within the classroom. It is also a major hurdle for Saskatchewan school divisions because we simply do not have the funding available for such crutches within our systems. Until there is a change it’s going to be difficult to properly implement technology within education. For the second part of our blog post, we were asked to choose an image, from George Couros book, The Innovator’s Mindset: Empower Learning, Unleash Talent, and Lead a Culture of Creativity. (2015) to help us discuss Ed Tech leadership issues within our school division. I have chosen image #2. I have found of the last couple of years that when students are not in control of aspects of their learning they become disengaged. A lot of educators that I have talked to throughout my career struggle with this aspect of education. Now that we have some technologies at our disposal and student engagement has the possibility to skyrocket educators are hesitant to let go of control and let their students take control of their leaning. The number one problem is the student’s voice, they do not get the opportunity to explore and learn from others and different resources often simply because there is a lack of computers in the building and there are a number of connectivity issues when they do have the opportunity to work with them. With a lack of funding in education, this type f educational practice suffers and teachers feel forced to resort back to their older practices…the talking head in front of the class. Although I do find this valuable at times it’s important to have a healthy balance and let some exploratory learning take place in the classroom. Although there are a number of different opportunities for our classrooms to take advantage of technology within their walls, there are a few roadblocks in the way of successful integration of efficient and competent technology practices. The two interviews from this unit have given me hope for the youth of tomorrow within the realm of education. The ways in which Regina Catholic School Division and Sun West School Division have successfully integrated tech practices within their schools makes me realize that education is on the right path. The major issues that stand in our way are the lack of funding and proper training, a result of insufficient funding from the government. These school divisions are paving the road for the future of other divisions within Canada and it’s an important step in investing in the future generations. Great post Adam, I really liked your infographic for the SEMR model as the pictures of the various levels of learning are vary apparent based on the ‘depth’ of the activity. My troubles, in properly going deeper into topics, often stem from the time it takes for inquiry based learning in higher level courses. I am teaching Pre-Calculus 30 and the amount of information to impart to students is overwhelming even with the ‘talking head’ method. I attempt to integrate technology and have students explore introductory concepts but ultimately feel like the curriculum forces us to teach material that is ‘a mile wide and an inch deep.’ I’m not sure how elementary and middle years teachers feel about this matter, and would be curious to know. I was also very surprised to hear how engaged students at in the SunWest Division are (from 60% to 80%) as this is one of the Regina Public Schools major strategic goals and I have been working with a Learning Leader in our school to improve student engagement in our school. We have focused on teacher practice, relationships, and environment but did not really consider the impact of meaningful integration of technology in the school! This may be a very important missing peice if we can overcome the unfunding hurdle you speak of in your post. Thanks for the great post. I agree with you when you say that there needs to be greater support for teachers and students when implementing technologies. I often think about the stress put on those teachers who do not have the skills to be properly implanting technology into the classroom. Not only is there significant stress, I think there is often external pressure to implement technology in the classroom. If we applied this to jobs outside of teaching, I wonder how many people would be forced to make significant changes with minimal guidance or training on how to do it. I would guess there would be a lot of backlash and resistance to making these changes. Given the constraints of education in this province, you have to applaud those teachers making significant progress in this area with minimal support. In the end, I think many schools divisions would benefit from a team of teachers focused on helping teachers implement technology in the classroom. This support would allow many of our teacher become comfortable with technology and move towards redefining tasks in the classroom. Great analysis of the strengths of RCSD’s and Sunwest’s innovation projects, Adam. I think you have here a really solid theoretical foundation for your own leadership project, moving forward. Hey Adam. This is a great post that discusses a lot of great idea. A few things I drew from you post are that teachers are struggling to determine where they fit in their students’ learning now that technology offers so many opportunities. When looking at integrating technology it can be incredibly intimidating for teachers to give up control and allow students to take some of their learning into their own hands. Adding technology is not the easy way out for teachers. A teacher is not getting replaced by Google. Rather a teacher’s role is simply changing. A teacher is taking on the role of facilitator and teaching students skills to decipher the knowledge that is readily available to them. A teacher is having students practice critical and creative thinking skills because no longer do we require students to memorize and regurgitate information, but rather apply their knowledge and use it to solve problems. Technology also brings new classroom management concerns and struggles. Monitoring student access, solving technological glitches, and learning new tech tools are all more work. Teachers need to be prepared and willing because forcing technology on teachers who are not willing will only result in a lot of substitution.